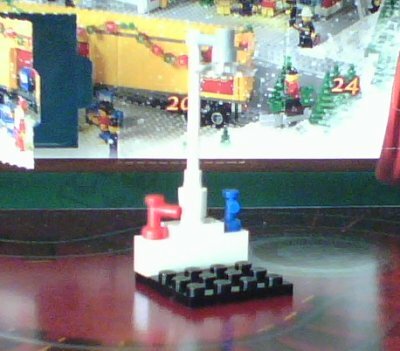 Bloggity-Blog-Blog-Blog: LEGO Advent Update 3! 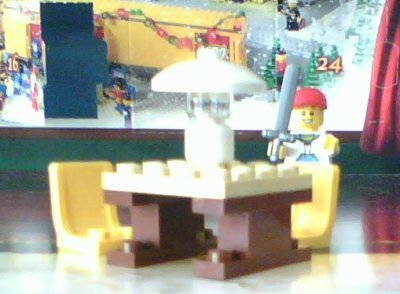 This is my third update of the 2010 LEGO City Advent calendar, which I've been blogging regularly. Apparently a couple of people are reading this, and might even be enjoying it in the spirit intended. So I'll keep going and see if I can bring this thing to any sort of conclusion by Christmas morning. In our last exciting edition, we learned about Sally's gifts, including the unfortunate airplane incident, and we met Dad and his hearth. Today we start off with Dad's gifts. 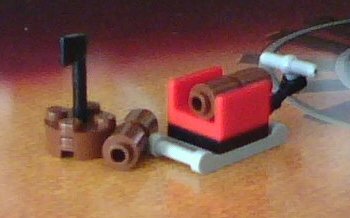 Uncle Bob thinks that Dad doesn't get enough exercise, so he got him a nice new axe and a sled for bringing in firewood for the hearth. Dad reacted with his usual non-reaction, not having the heart to tell Bob that the hearth doesn't ever seem to actually need any firewood. Within minutes, Jimmy was chasing Spot around the house with the axe, and Sally had managed to convince her cat Princess Frumbles del Toronado Squiggle la Fluffybot 2000 Sharpclaw the Magnificent, aka "Shredder", to get on the sled for a trip around the living room. Shredder lived up to her name by shredding the pieces of firewood that Bob had brought in to demonstrate the use of the sled. Mom piled the resultant kindling up in a pile near the hearth, and was later seen tossing pieces in to watch them burst into flame. 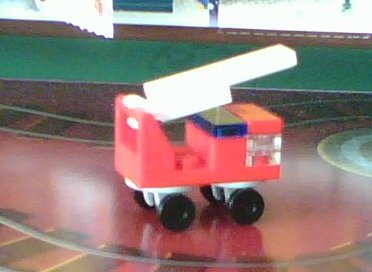 Dad opened the large mysterious box which didn't have a name on it and was surprised to find what appeared to be a toy fire engine inside. Nobody seemed to know who it was from or even when it appeared, but after a few moments it started itself up and drove to a spot near the hearth. Spot came over to sniff it, yelped, then immediately ran into a corner and apparently tried to crawl through the floor. Shredder sniffed at it, hissed, then carefully kept an eye on it thereafter. Jimmy attempted to play with it but couldn't move it from its location near the hearth nor get it to drive itself again, despite shouting, hitting it with various items, and kicking at it. Eventually he gave up, to everyone's surprise, and went back to playing with the axe. This is Mom. She's surprisingly patient with Jimmy, and adores Sally. 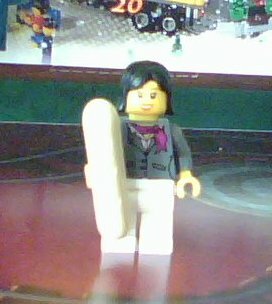 She often wanders around the house with a loaf of french bread, as seen in this picture. Bob teases her about it, claiming she could have a sword hidden in there! Mom always laughs weakly at that joke, and can sometimes be seen hiding issues of Paul the Samurai away. If confronted, she'll claim the books are Jimmy's, even though Jimmy doesn't read anything that doesn't have detailed instructions on how to destroy stuff. Mom doesn't actually care very much about the stuff Jimmy destroys, as she has a higher purpose in life... which isn't really that relevant to this sweet little Christmas tale, so we'll move on to Mom's gifts. This is Mom's new patio set moments before Jimmy reached it and started to dismantle it. This is the fifth set she's gotten this winter, although she's assured Dad that she really doesn't need one. The neighbors tut-tut about how sad it is that she can't keep a patio set in one piece, so Dad continues to attempt to keep up appearances. Uncle Bob was really proud of this gift! 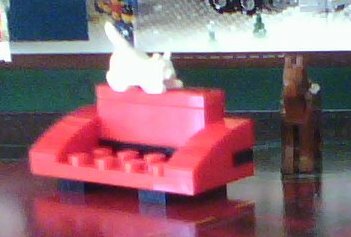 It is said to be the most indestructible sofa ever made, completely and utterly cat-proof. Shredder hopped up on it and ran one claw down a cushion, and seemed surprised to not see it split. In moments Shredder had claimed the top of the sofa for herself, and Spot had claimed the part of the sofa that was away from everyone to hide behind. Late at night Shredder can be heard working on the sofa. Bob has a bet with Sally on, Sally thinks it won't last until Spring, but Bob is sure that Shredder won't get through it at all. Bob will lose that bet. Although a little difficult to see in this picture, this is the replacement shower that Mom got from Dad after Jimmy removed some of the crucial pieces of the last shower in order to make an "acid gun" which fortunately did not work. Sally is certain that the acid Jimmy used was too strong, while Jimmy thinks he just didn't get enough pressure to shoot it out before it started to work on the pipes. Jimmy's eyes lit up when he saw the shower, and he hefted "his" axe. And so the family enjoyed the presents and the usual chaos reigned.